4 Bedroom End of Terrace House For Sale in Norwich for Guide Price £270,000. This three storey Georgian styled townhouse offers families fantastic and flexible accommodation. Set in the well regarded Hamptons development built by Hopkins Homes the property is well situated on the western edge of Norwich for the UEA, the University hospital and the John Innes centre. Set in easy reach of the Longwater retail park which has superstores, restaurants and a gym the property benefits from regular buses into the city centre which has the best shopping facilities in East Anglia. By car the A47 and A11 are only minutes away. 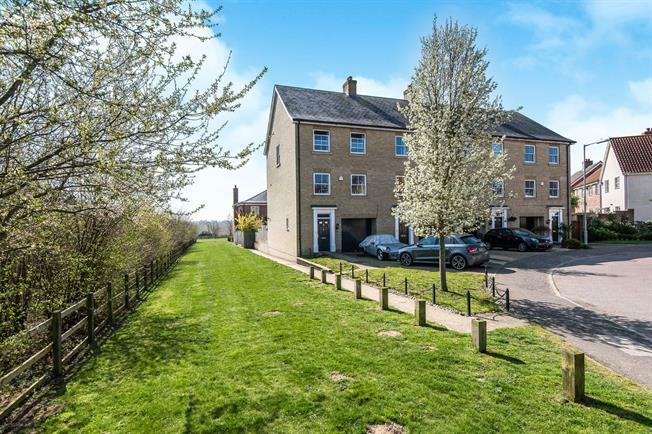 This three storey town house offers generous accommodation and occupies an excellent location with the development away from the main road. With trees planted to the side of the property and views over fields at the rear from the upper floors it has some details that set it apart from many in this location . The ground floor has a double bedroom 4/study integral garage, WC and utility room opening on to the rear garden. The first floor has a large lounge with feature fireplace and a well fitted kitchen/diner. The second floor has three bedrooms with an en-suite to the master and a family bathroom. The property offers gas central heating, double glazed windows and parking. The rear garden has been landscaped with terraced shingled beds for easy maintenance. We highly recommend viewing to fully appreciate property .